These nails were a lot of fun and so simple. 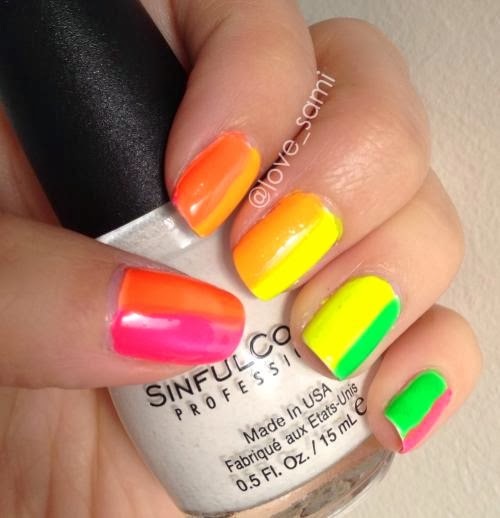 The best tip I can give you with using neon colour nail polish is to put a coat of white nail polish on first and then put the neon colour on over the white. It makes the colour more vibrant. I used a toothpick to pick out the little bits of glitter and positioned them around my nails. I used the nail polish set below to create both the designs in this post. With this mani I painted some white nail polish on first using the Sinful Colors I'm holding in the picture, then I picked 5 of the colours above and simply painted one side with one colour and continued it along to all the other fingers and the other colours. What manicure are you wearing at the moment?